Rice Lake DeckHand Portable Scale is a mobile floor scale with indicator platform. Partnered with one of Rice Lake’s battery-operated indicators, such as the IQ plus® 390-DC or IQ plus® 590-DC, you have a clearly visible weight anywhere the scale is located. 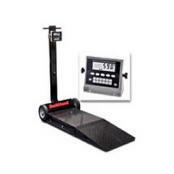 The Rice Lake Weighing Systems DeckHand Portable Scale is a mobile floor scale with indicator platform. Be sure to order this factory calibrated with one of Rice Lake’s battery-operated indicators, such as the IQ plus® 390-DC or IQ plus® 590-DC, and you'll have clearly visible weight anywhere the scale is located. If product is loaded off-center, all four corners of the platform weigh perfectly, so weight is measured accurately from anywhere on the platform. Take this scale to any work area for immediate weights of large stationary items. The DeckHand’s large rubber wheels simplify movement on uneven floors. The two wheels hover when stationary so the weighing platform remains stable despite variances in floor contour. Aluminum environmentally-sealed load cells help keep things lighter for easier mobility. Part # ......... Overall Size (WxLxH) .... Capacity .............................Ship Weight..
43376 .........Ramp assembly, 500/1000 lb, mild steel, 25" x 27"
43378 .........Ramp assembly, 2000 lb, mild steel, 25" x 27"